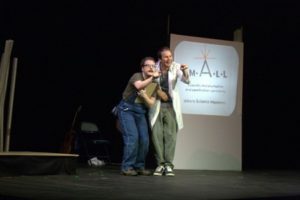 You’ve seen it before in movies like The Fantastic Voyage, The Incredible Shrinking Woman, Alice in Wonderland, and Honey, I Shrunk the Kids so the concept is nothing new and Fringe entrant, “The Man in My Beard” follows that hypothesis. 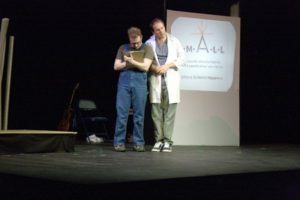 “The Man in My Beard” currently plays at The Arts Asylum and features two very talented actors, Bob Linebarger (Al), a ne’er-do-well common man and J. 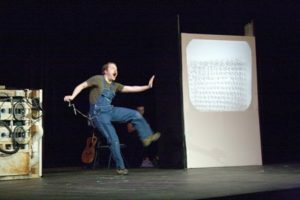 Will Fritz (Frank) a janitor who gets accidentally zapped to become so tiny that he lives in the beard of Linebarger’s character. The premise is fun, but the one-joke idea does not contain enough good material to create an hour-long play. 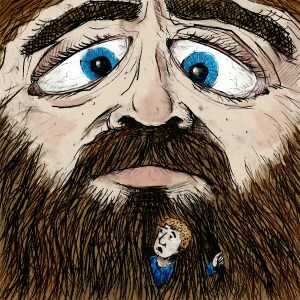 According to the Fringe info on their website:“The Man in my Beard” is about just that! Frank, a janitor at S.M.A.L.L. (Scientific Miniaturization And Lessification Laboratory) is accidentally shrunk and finds himself living in the long beard of Al. Frank has survived by fashioning a hammock in Al’s soul patch and feeding off crumbs stuck in his beard. In the more than year that he lives there, Frank helps Al navigate falling in love, changing jobs, getting drunk, and going viral online, meanwhile missing his wife who has no idea what has happened to him. Frank is insightful and rooting for the awkward Al. They live in strange symbiosis until the evil scientist and his assistants back at S.M.A.L.L. catch on to Frank’s whereabouts and set off to catch and destroy him. This coincides with Al becoming aware of Frank’s existence and they work together to protect each other. The Fringe synopsis tells the story and intent of the show. Sadly, much of that is lost in the presentation and the actors must work hard to keep the audience focused on the story. Some funny lines exist in the play, but not enough to carry the play. 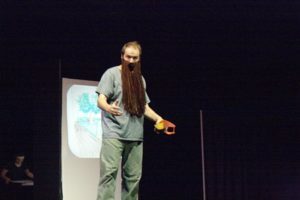 Linebarger, hidden behind a horrible prop (a foot long, stringy beard that looks like dred locks gone bad) cannot use is facial features to move the play forward. The beard distracts from Linebarger’s efforts. Fritz fares better as his character is never camouflaged. The best parts of the show are the two characters speaking the same line simultaneously with matching cadence and expression. 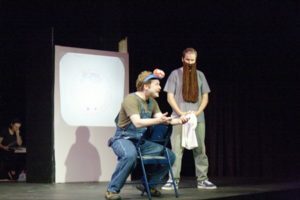 “The Man in My Beard” continues at The Arts Asylum for several more performances.